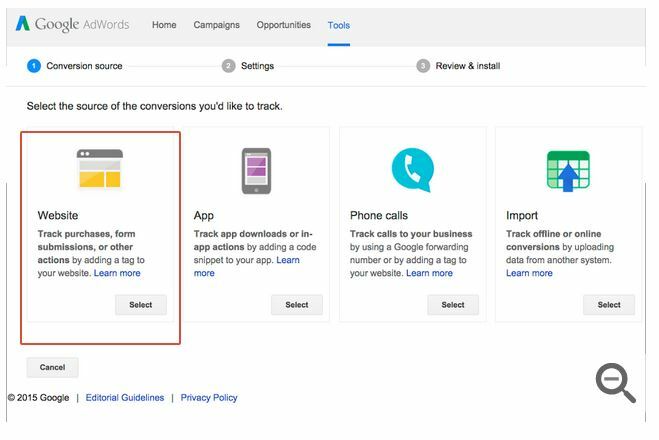 I’ll wrap up the series this week by covering an absolute MUST DO in your AdWords account – tracking conversions. What Are Conversions and Why Are They Important? There are so many moving parts within an AdWords campaign (keywords, budget, bids, scheduling, quality scores, impressions, clicks, click-through-rates, and-on-and-on-and-on…) it’s sometimes easy to lose site of the forest for the trees. We focus so heavily on these tactical aspects that we forget to address the biggest issue of all: At the end of the day, how successful are my efforts in generating leads or sales? That’s where the concept of “conversion” comes into play. A conversion is that awesome moment in time that excites marketers like me! It’s when your visitor takes your intended ACTION. For online retailers, it’s when someone enters their credit card info and clicks the “Purchase” button. For business-to-business marketers, it’s when someone requests your free whitepaper or demo by providing their contact info. (I’m a nerd… honestly, just writing about it gets my pulse racing just a bit). As a marketer, a conversion is a big step. It’s what we’re driving for – the sale for e-commerce sites… the contact info for a business-to-business site. You should always be tracking conversions. Only then will you have hard numbers that indicate the success you are having with AdWords – things like your average cost per lead, which keywords result in the highest percentage of conversions, and more generally… what is your overall return on investment. Important stuff! Conversion tracking (paired with subsequent sales tracking in a business-to-business environment) is your key to growth within AdWords. I often use the example of a “special vending machine” with my clients. With proper tracking in place, you will clearly see that for every quarter you put into the machine, it spits out X amount. If the machine spits our LESS than you put in… you need to quickly fix the machine or stop using it! If the machine spits out MUCH MORE than you put in… scrape up every quarter you’ve got and feed it to the machine! Only by tracking conversions will you clearly understand how much the AdWords machine is spitting out for your company. 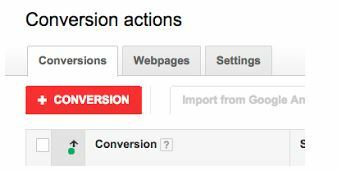 Luckily, Google makes it very easy to define conversions (i.e., a specific page or pages on your website) within your AdWords account. You’ll just need access to your AdWords account (duh…) AND ALSO admin access to your company’s website. Here’s how you do it, step-by-step, direct from Google. Click Name. Enter the name of the conversion you’d like to track on your website. This will help you recognize this action later when it shows up in conversion reports. An example might be “newsletter sign-up” or “wedding bouquet purchase.” Click Done. Click Value. Select whether each conversion has the same value, varying values (for example, purchases of products with different prices), or select “Don’t assign a value” if you’d prefer not to count one. Click Done. Click Count. Select whether to count all or unique conversions. “All” is best for sales; “unique” is best for leads. Click Done. Click Conversion windows. Select a conversion window (how long after an ad click and ad impression you want to track conversions) and a view-through conversion window (how long after an image or rich media Display Network ad impression you want to track conversions) for this conversion action. The window can be as short as one week or as long as 90 days (30 days for view-through conversions). Click Done. Click Category. Select the category that best applies to your conversion. If you’re tracking newsletter signups, you’ll pick “Sign-up.” For purchases, you’ll pick “Purchase/Sale.” If your conversion doesn’t fall into a listed category, select “Other.” Your choice here is used simply to segment your conversion reports. You can always change it later. Click Done. Adds data from this conversion action to your “Conv. (opt. )” columns. Optimizes bids for this conversion action when using automated bid strategies such as Target return on ad spend, Enhanced cost-per-click, or Conversion Optimizer. Uncheck the box if you don’t want to optimize bids for this conversion action. Otherwise, leave it checked. Click Done. QUICK TIP: As you think about which page on your site represents a conversion, be careful. If you’re new to this concept, you might assume your credit card entry page, or your whitepaper signup page are examples of conversion pages. Makes sense, right? Well… almost. Just because someone makes it to these page doesn’t mean they have taken your intended action. People bail from these pages all the time. You can only be sure they have taken your intended action by specifying your purchase confirmation page or your whitepaper signup confirmation page as your conversion page. That will give you a sense for true conversions. Open up the HTML for the page your customers reach on your website after they’ve completed a conversion—the “Thank you for your order” page, for example. This is called the conversion page (SEE PREVIOUS TIP). Between the body tags (<body></body>) of the page, paste the tag you generated in Part I above. Save the changes to your webpage. And that’s it! This all may sound a bit technical, but it’s actually quite easy if you follow the steps outlined here. It takes a few minutes, but it is well worth the effort!